We put so much time into planning out our greenhouses — glazing options, size, lighting, bench/table configurations, even décor. But sometimes, we forget to consider one of the most basic elements of the greenhouse, the floor. There are many options for flooring material, ranging in cost from quite inexpensive to fairly costly, but every greenhouse floor must start with positive drainage. With all of the misting and watering that occurs daily, the last thing you want is to create a soggy, slick basis for walking and working. So start with good drainage and take that into account as you are making your flooring decisions, then check out these options to determine which one fits your budget, aesthetic and lifestyle. Although pouring a concrete slab is likely one of the more expensive flooring options, it creates a permanent, solid basis for your greenhouse activities. Much like a patio floor, a concrete greenhouse floor will need to have a surface drain installed to allow water to drain out. Pouring a concrete floor is not an easy DIY project as there are too many variables to cover, so this is an option best left to the pros. The investment will repay you many times over, though. 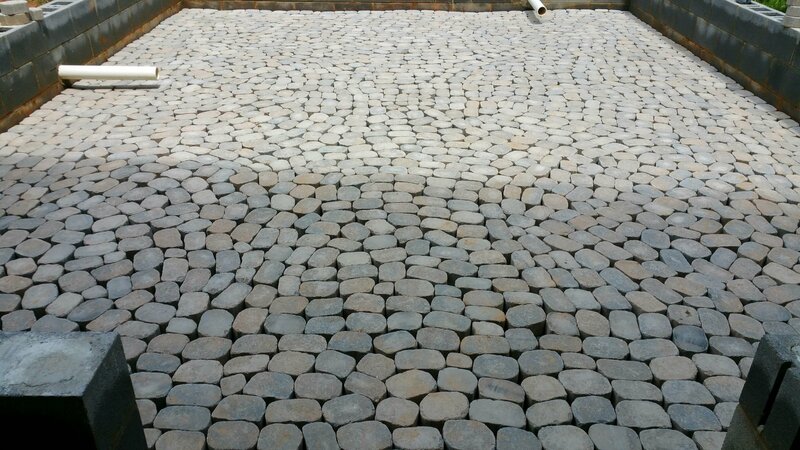 Similar to the concrete slab, stone flooring is a more permanent option, especially when mortared in place. If you opt to forego mortaring, space the stone closer together and use a stabilizer in between such as decomposed granite or gravel. Make sure you choose a stone that has a flatter, smooth surface, as you don’t want to be tripping as you work — look for larger, flatter pieces labeled “flagstone” or “patio stone,” and forego lesser expensive “field stone” that tends to have a bumpy, irregular surface. A surface drain is also a must if you opt for a mortared stone floor. Brick flooring is a beautiful, elegant and permanent option, but it can also be a more expensive one. Brick, like stone, does not necessarily need to be mortared in place, but it will need a surface drain if it is. If your greenhouse location has relatively level ground, and you have some basic DIY skills, this could be a project for you to take on, but most greenhouse owners will want to consider hiring the pros to correctly install this floor. Many greenhouse owners opt for pea gravel for their flooring. It’s inexpensive, creates positive drainage and is readily available. You can also opt to install weed barrier underneath the gravel, and option that I recommend to keep the gravel from settling into the soil and disappearing. Be sure to keep the gravel clean by periodically washing it down, as a build-up of moisture can create a slick surface. As easy DIY project, gravel is a great middle-of-the-road approach to creating a functional greenhouse floor. Also known as weed barrier, this woven black fabric is the choice of many commercial greenhouses to suppress weeds and create a nice level floor for walking and working. It allows water to pass through, creating positive drainage, while at the same time keeping your floor from becoming muddy. If you choose this option, go for the more expensive, commercial grade fabric, as it truly is a more durable and effective product. As with most things in life, you get what you pay for — and why go to the trouble of installing this product if it’s not going to do the job? Good old-fashioned mulch is a great option for greenhouse floors — it provides great drainage, sure footing and enriches the soil as it breaks down. It’s also readily available and inexpensive. Opt for a higher quality shredded mulch rather than wood chips, as shredded mulch interlocks to form a tighter mat upon which to walk. You’ll need to replenish your mulch floor as it breaks down, but it’s an easy annual task that any homeowner can do. It’s available both in bags as well as in bulk (per cubic yard), with the bulk option being the least expensive by far.